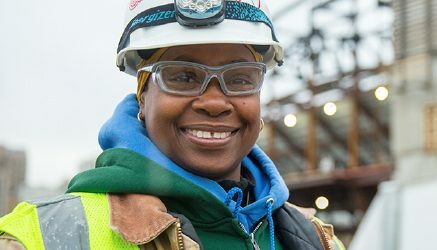 For Synnia Snead, the Detroit Events Center is one of the most exciting and important projects that she’s worked on in her nearly 20-year career as an electrician. Snead is one of 35 electricians working on The District Detroit arena project for Detroit based Motor City Electric Co., which has been located in the city for more than 60 years. Snead, a Detroit resident, began her career as an electrician’s apprentice working mainly in Detroit auto plants and in public schools before attaining her journeyman’s license. Just like every other project she’s worked on, Snead pulls wire, installs conduit and hangs lighting fixtures, but something about the future home of the Detroit Red Wings, located right in the center The District Detroit, feels special to her.